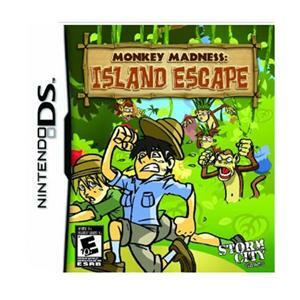 Monkey Madness "Island Escape" for DS... You are flying happily over the ocean on safari, when your partner discovers a problem with the nose of the airplane, and before you can react, the engine explodes in a cloud of fire and smoke! Your plane is careening towards the ocean and sudden death when luckily, you spot a small deserted looking island to make an emergency landing on. You crawl from the wreckage alive and relatively unharmed, and decide that something feels amiss. The island appears to be empty, but you can feel eyes watching your every move. As you explore further, you realize the island is inhabited by very clever and aggressive monkeys who will stop at nothing to eject you from their territory! Armed with a water gun, slingshot, and other weapons you must maneuver though various groups of dangerous chimps and their shadowy leaders all over island, and discover a way to escape with your life Full 3D graphic rail shooter; Easy, fun and challenging touch screen game play; 10 levels each which its own design and style; 4 different game play modes including multiplayer.